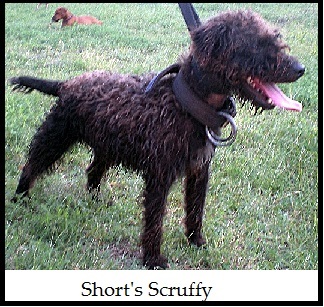 What a Patterdale Terrier might look like! We've become the bad boys of the Patterdale Terrier world because we don't hide these truths. This is a Big subject so be sure to scroll all the way down the page. It's amazing! 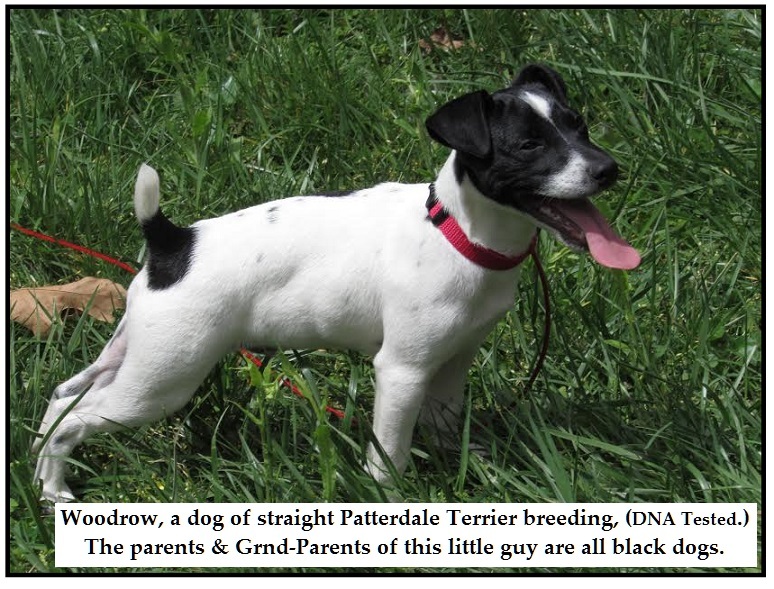 Always remember, a particular color or "look" is-not what makes a Patterdale Terrier. whatever that color was would be our favorite and we'd breed for it! 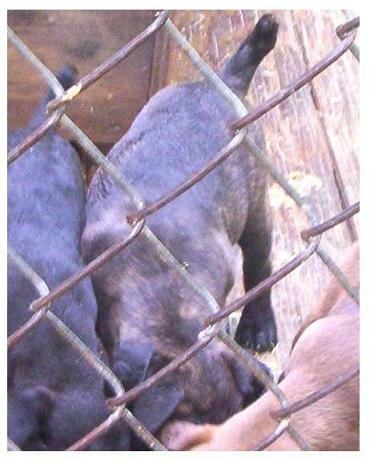 Pixie (a black-brindle) ... was kept in G.L.& C. Co.'s kennel operation. Her page is here somewhere. "Millie" (black w/white marks) ... is view-able on the Other Photos page. Chocolate-Red male, called Redman, ... went to a fox hunting club. 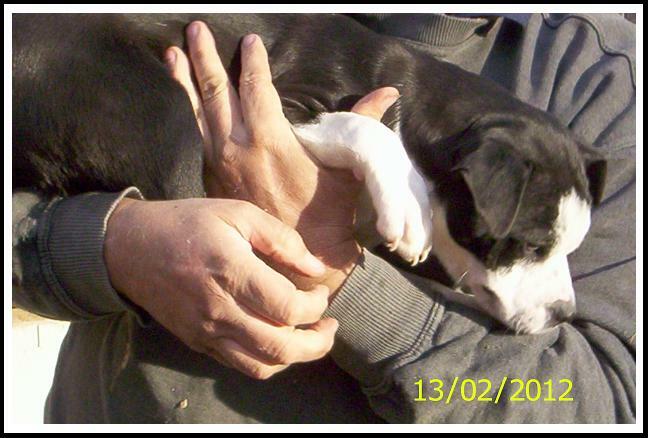 White-face female is "Soozy" who is enjoying a life of privilege and comfort as a white-collar companion/pet. 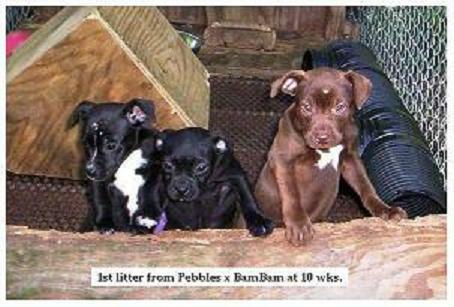 Grown up Patterdale Terriers range in size between 10-lbs to 30-lbs. Here is another look at that white-faced male "Whitey" shortly before sending him to Todd for delivery to his new owner. Whitey grew to be bigger than every other pup in the litter by the time he left here. In America the smaller size is greatly favored and the show crowd has developed some that can only be described as "dainty little things." 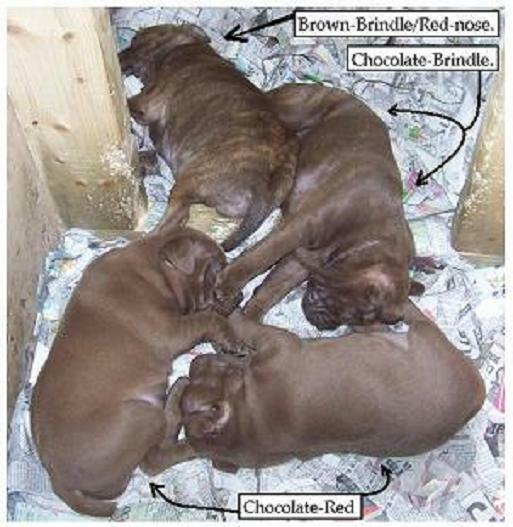 This photo (below) shows the 1st litter from Whitey's parents. 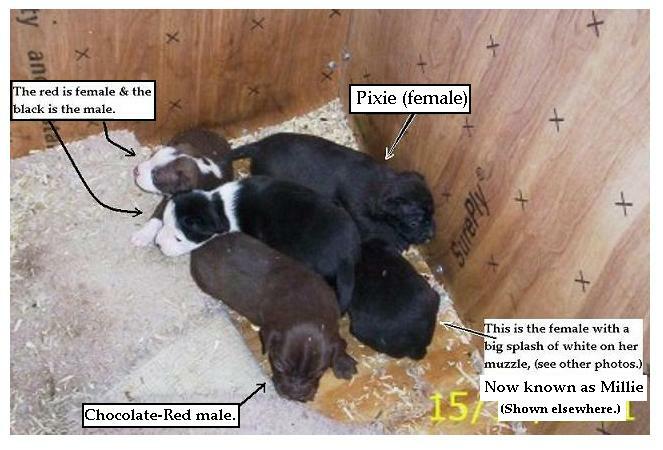 These and the 2nd litter were all of more standard appearances. 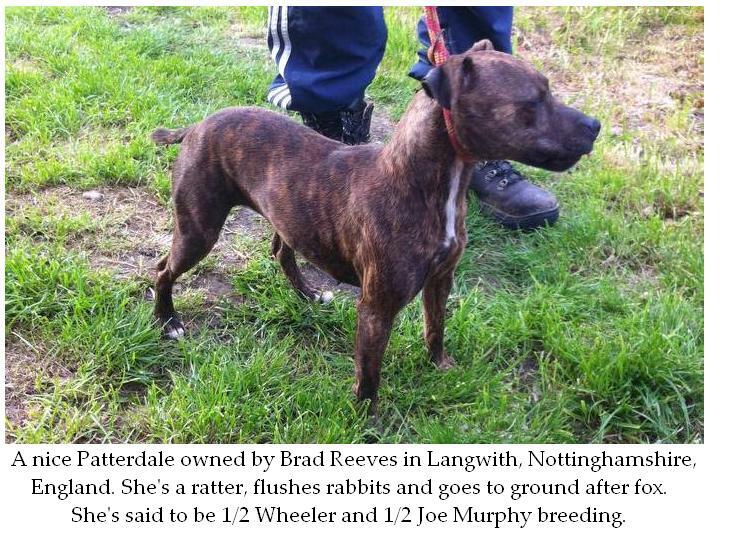 Brindle is different from "grizzled" which is almost common in this breed. 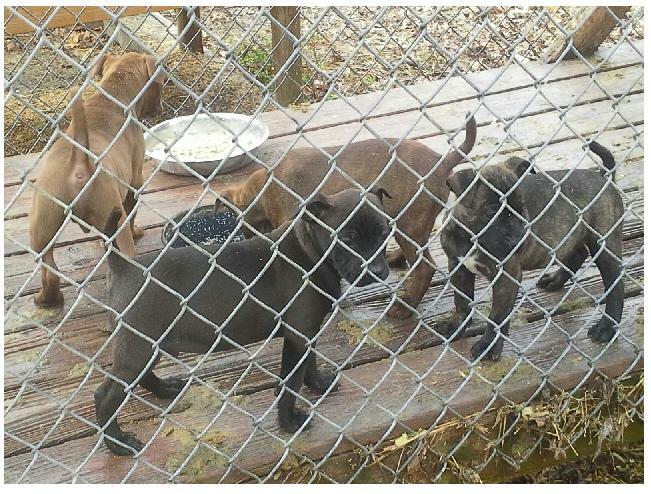 The 1st litter sired by Pinga (above)...the pup in the center is Black-Brindle. 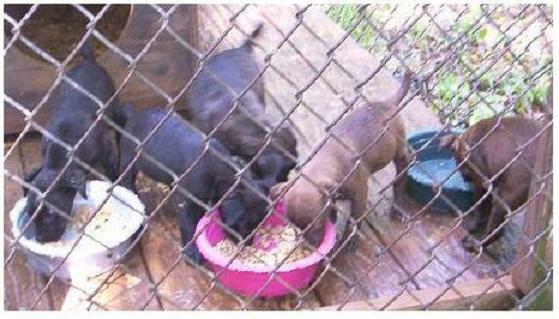 Here is another look (left) at that Black-Brindle pup (now known as Bosco) from Pinga's 1st litter. 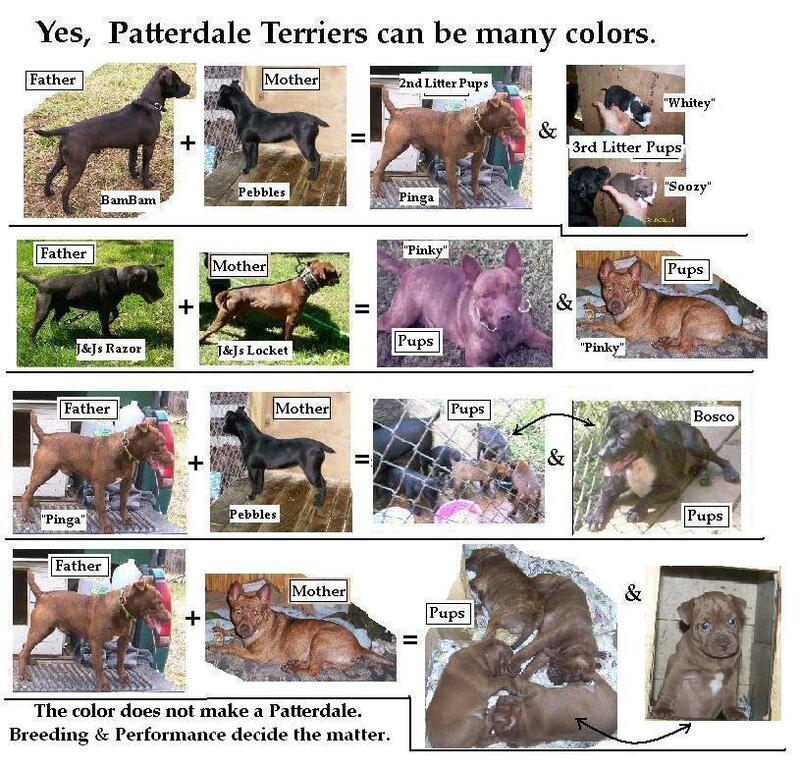 The color / pattern of these dogs has nothing to do with the traits that are being bred for. 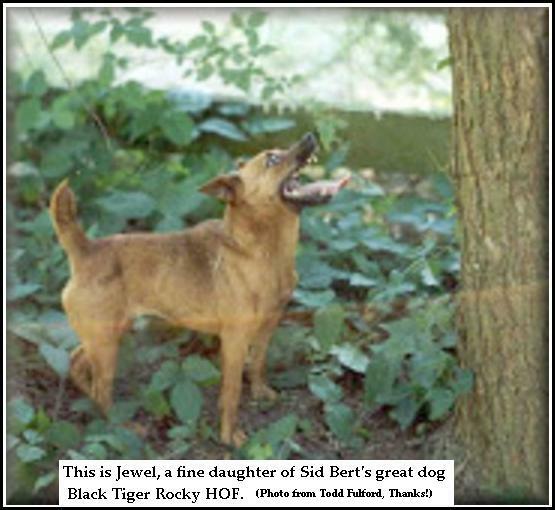 An unusual color pattern only makes the dog stand out from the crowd by his appearance alone. Colors and patterns are not deciding factors for breeding or suitability for work. 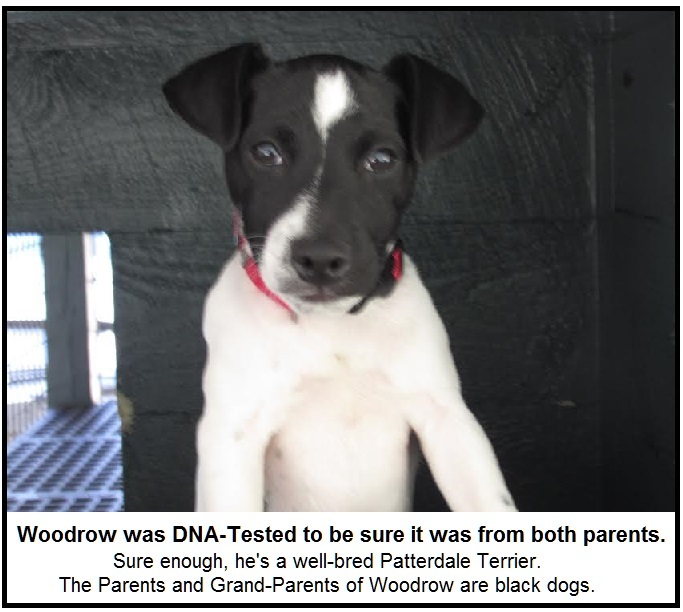 All breeders of Patterdale Terriers know about the many colors, markings and sizes. In each case there was only one pup in the litter that had upright ears. And now, (since we don't breed for appearances,) we're getting different "looks." Even so, black and chocolate are what we see most of the time. 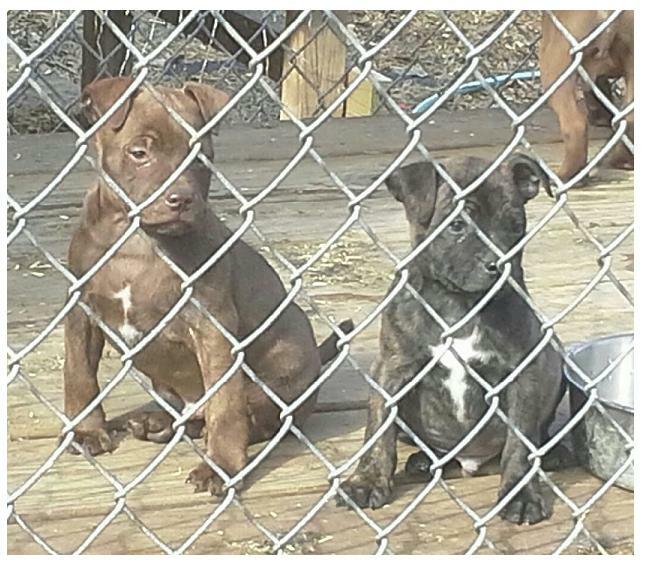 Here (below) are two litter-mates from a high-powered breeding of Maxine to Bambam, (Maxi-Bam) born Jan. 2015. Never mind the colors, look at the forearms on these little guys! Here's a photo showing the 2 above and the other males all of this same 2015 litter. 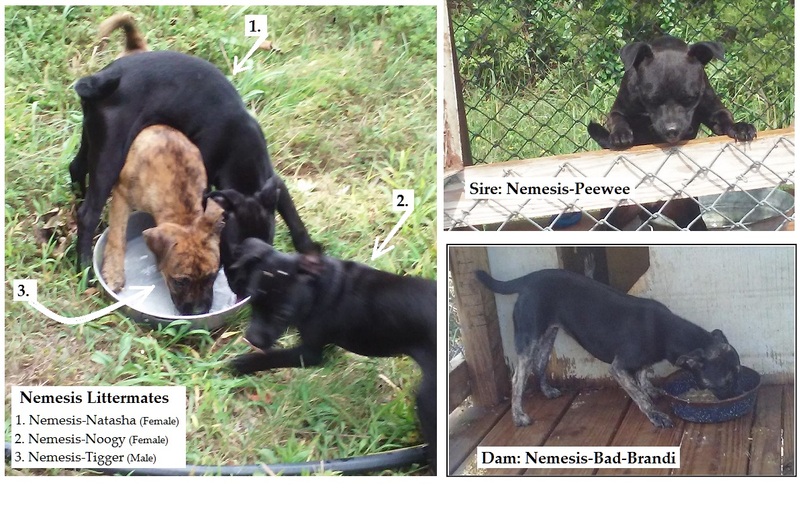 The brindle in these dogs came from way-back in the pedigrees. A lot of breeders like to keep this quiet for reasons that we don't quite understand. Their color doesn't effect their performance one bit. 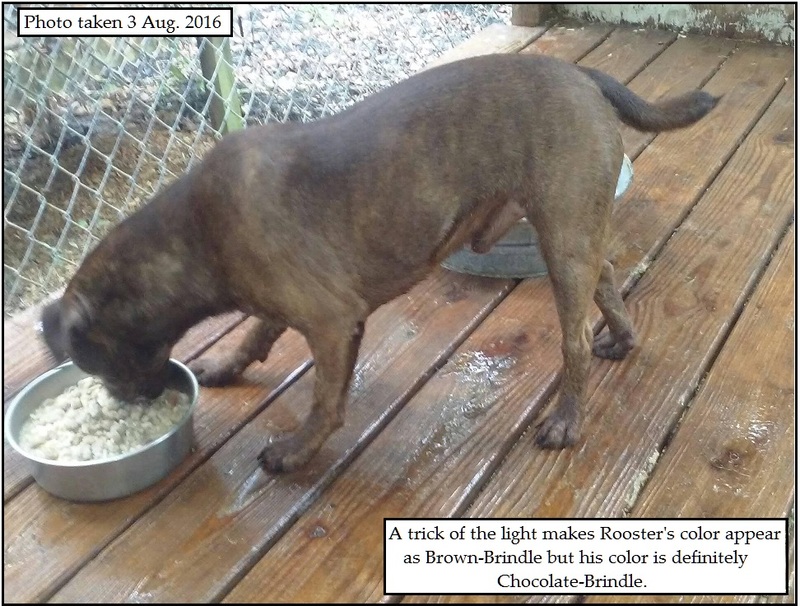 There's plenty of brindle (and other color schemes) in Europe. It's not "uncommon" here or there. Her 1st kill was the family Parakeet (?) After that...all business! On appearance she could be related to our "Pinky" dog but they're only barely related from waaay-back in their pedigrees. Now and then we even see this color scheme. This is Brandon's Woodrow, a cool little dog from verified parents and proven bloodlines. Woodrow is only 5-months at the writing of this note: He recently dug a bit to get into it with a groundhog. He went the distance with the 'hog and his face looks like it too! Seems like he's the real deal! Kudos to Brandon! As stark examples of the "broken coat" appearance, these guys are awesome workers. 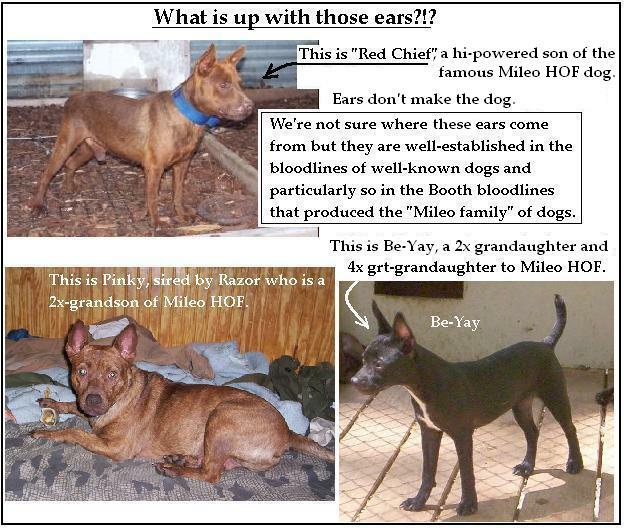 These two dogs, (above) are from super hi-caliber Patterdale Terrier stock in Oklahoma, USA. The show-dog crowd makes a real effort to keep quiet about just how much appearance varies in these dogs. They hate to let the public know the truth, as shown in this photo. It's presumptuous to say that a dog is or is-not a Patterdale Terrier based on just it's looks. It wouldn't matter if the dog was purple with green polka-dots as long as his parentage was known and he demonstrates his mettle in the classic way to the satisfaction of his breeder or owner. 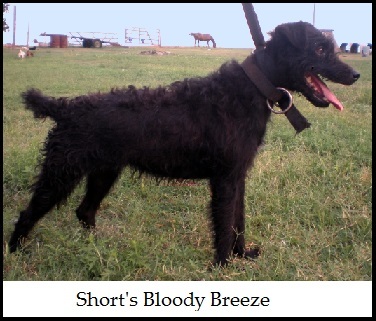 It's breeding and performance that make them Patterdale Terriers!